In what could be a very significant move, Turkey's state broadcaster (TRT) is set to launch a Kurdish-language channel in the beginning of 2009. Full details about the channel, called TRT 6, are still sketchy, but it promises to provide much more than the pitiful current level of public broadcasting in Kurdish, limited to a few hours a week and hardly watched. Dedicating a channel to Kurdish programming is an important recognition of a language that's the mother tongue of millions of Turks. But TRT 6's real aim, it appears, is to undercut the appeal of Roj TV, a Kurdish satellite network broadcasting out of Europe, that is extremely popular among Turkey's Kurds. Ankara has accused Roj of being a mouthpiece for the outlawed Kurdistan Workers Party (PKK) and of spreading anti-Turkish propaganda. But the channel, which shows a mix of news, music videos and other programs, has been able to become as popular as it is because there has been no other alternative out there. Taking on Roj might be a tough job, though. 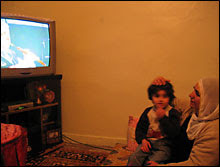 The network's appeal, besides that it broadcasts in Kurdish, is based on its independence and the fact that it shows things no Turkish channel would dare do, such as footage from the PKK's camps in Northern Iraq or performances by Kurdish musicians who are banned in Turkey because of their political views. The channel also acts as a kind of Kurdish grapevine. I was in the predominantly-Kurdish southeast of Turkey a few years ago working on a piece about Roj TV and met with a family whose son was a PKK guerilla who had recently been killed in a clash with Turkish forces. When I asked them how they found out about their son's death, both parents told me that it was through Roj. I heard similar stories from other people. If TRT 6 puts on some innovative programming, or at least programs that aren't produced with a very heavy state hand, then it and Roj TV might be in for an interesting ratings battle. We'll be watching. Reminding that he was punished for playing Kurdish music during an election period by the Kars Criminal Court of First Instance with three more people, Alınak said, “The state made this move because it could no more go on with the century long ban. Since it could not silence technology the Kurdish TV channels that already exits, it will try to reduce their influence.“The state made this move because it could no more go on with the century long ban. Since it could not silence technology the Kurdish TV channels that already exits, it will try to reduce their influence." In Ankara, political parties are similarly divided. Predictably, CHP leadership is discontented while AKP and government officials hail the channel as a major step forward in the state's relationship with its Kurdish minority -- roughly 20 percent of its population. After the 1980 coup, Kurdish language was largely prohibited in public places. Although there still exist numerous restrictions on Kurdish cultural life, a 24-hour Kurdish broadcast channel is a welcome development, especially if the channel is well-implemented and proves itself more than an election ploy. However, the channel has no firm legal basis, and appears more than a bit of a contradiction when restrictions are still in place that prevent the use of Kurdish letters in public documents. Pressing the government for further reform, DTP deputy Hasip Kaplan has proposed a law to include letters x, w, q in the alphabet and the removal of all the obstacles before the Kurdish language. And, to remove any question about the legality of using Kurdish in public -- which, given TRT-6, is indeed bizarre -- Gültan Kışanak, DTP’s Diyarbakır deputy, prepared a bill that will enable the Kurdish language to be used in the public space (see Bianet, Jan. 2). TRT's Kurdish broadcasts actually started in 2004, after the Radio and Television Supreme Council (RTÜK) approved legislative amendments that allowed TRT and private channels to broadcast in local languages and dialects. Following these amendments, on June 7, 2004, TRT 3 started broadcasting in both the Kurmanji and Zazaki Kurdish dialects, as well as in Arabic, Circassian and Bosnian, each for 30 minutes a day. Due to legal obligations, all broadcasts had to have Turkish subtitles and the content and timing of the programs did not attract many viewers. However, with the recent initiative of the Kurdish TV station, TRT officials seem to have taken a different view. In an interview with the Zaman daily, TRT General Director İbrahim Şahin said they would primarily use Kurmanji, which is spoken by 90 percent of the people in Turkey's predominantly Kurdish regions, and that they would later include the Zazaki and Sorani dialects, as well. "Our intention is not to scare anybody. We sincerely want to meet the need for a TV channel for people who couldn't learn Turkish. This channel will be a family channel, like TRT 1, that will have series, entertainment programs and news programs. It will have everything that a family channel offers. As long as our national unity, integrity, anthem and flag are not disrespected, we will produce the same programs for the Kurdish channel that we do on other TRT channels. In the Constitution, Article 2954 clearly indicates our principles and mission and, on the condition of remaining within these boundaries, our colleagues will be able to freely say and produce whatever they want," Şahin explained. In fact, Dec. 25, 2008, represented a remarkable day for the democratization of Turkey and the brotherhood of Kurds and Turks because the opening of the Kurdish TV station has a historical significance and meaning for Turkey. It's the common hope and desire of many people that this channel will be a democratic and objective project that will respect the cultural and linguistic rights of the Kurdish people. It is also hoped that TRT 6 will act as a bridge for sharing the language, literature, culture and traditions of Kurds and strengthening mutual love and respect between Kurds and Turks. Instead of making premature judgments and labeling the channel as a mouthpiece of the government, perhaps it would be wiser to give it some time and contribute to it in different ways. Just how those cultural and linguistic rights will be negotiated with Article 2954 and other Turkish law will, of course, be the real kicker. As Schleifer writes, we will be watching. For a great piece on Roj-TV, see Schleifer from 2006. For a coverage from the Economist, click here.